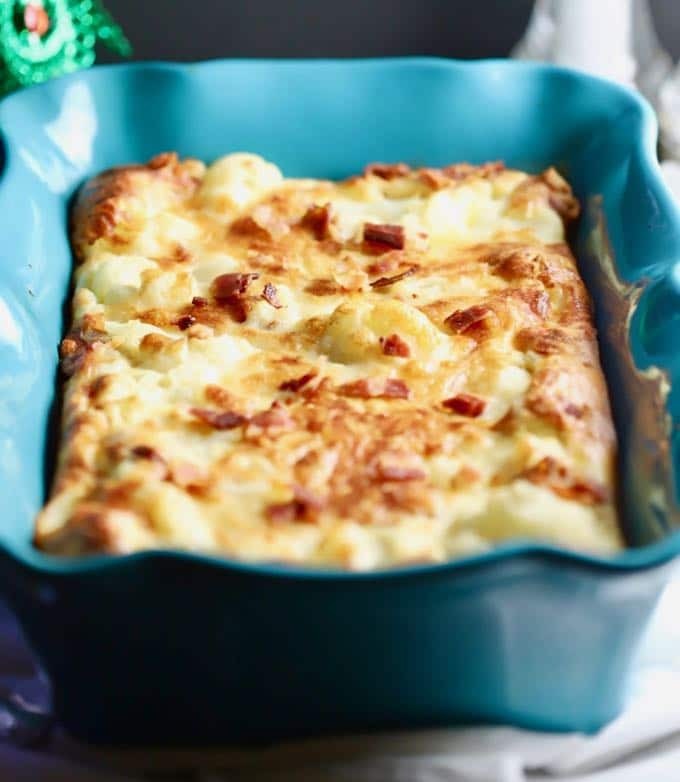 Easy Cheesy Cauliflower Gratin is the perfect rich and creamy, but low-carb side dish for your Christmas dinner or any dinner when you want to treat your family or guests to something special! It’s a true crowd pleaser! 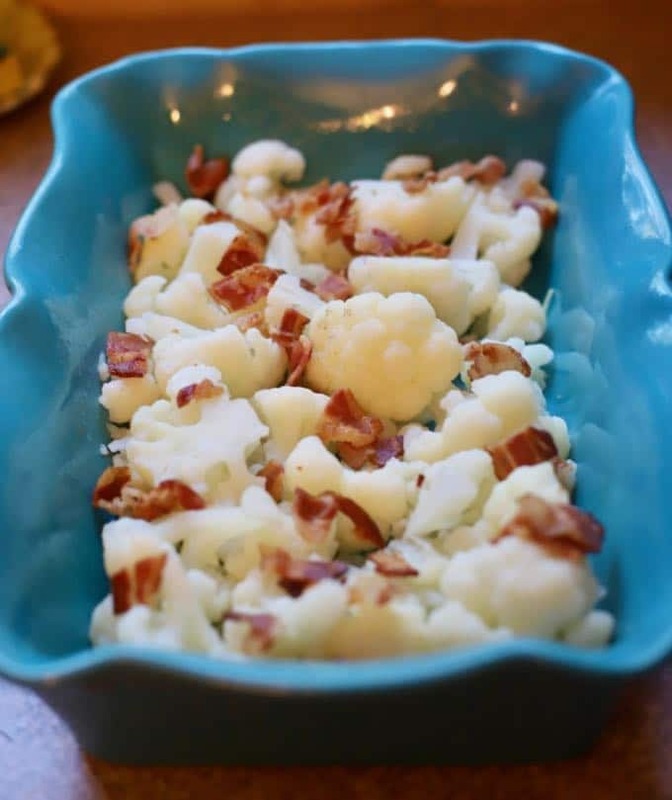 If you like cauliflower, bacon, and gruyere cheese you will love this flavorful side dish. 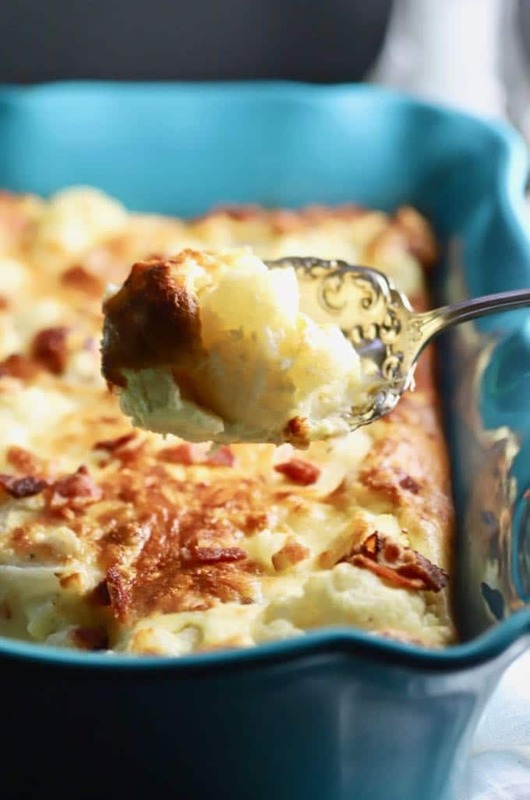 Because Easy Cheesy Cauliflower Gratin also contains eggs, this cheesy wonder tastes a little like a cross between a quiche and a light as air souffle. 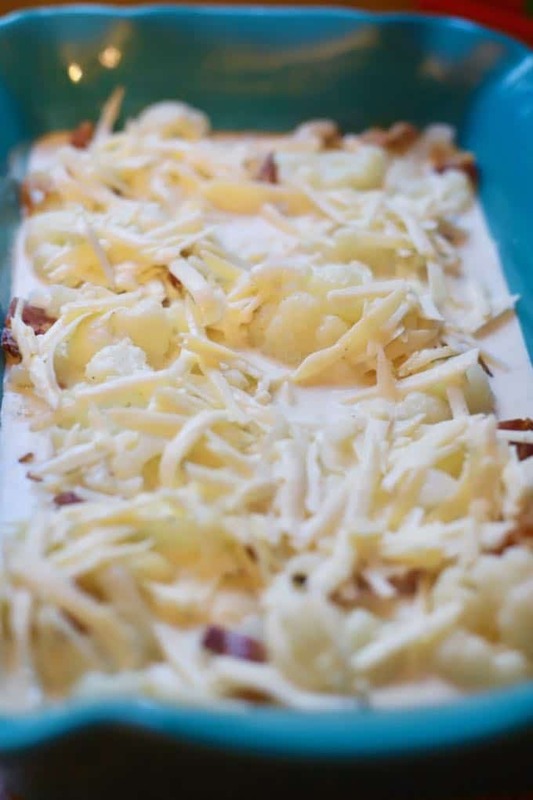 In case you are wondering, in cooking gratin means having a cheese topping which is sometimes combined with breadcrumbs Gratins are most often cooked in a shallow dish often called a gratin dish. I served this delicious cauliflower gratin with my Roasted Cornish Game Hens with Cranberry Stuffing for a special dinner and both were delicious and relatively easy to prepare. I added a salad and we had a scrumptious versatile dinner that would be wonderful for a dinner party or perfect for an intimate dinner for two. 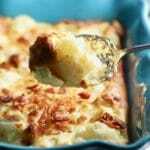 Easy Cheesy Cauliflower Gratin can also be served as a light meatless main-dish and is delicious paired with a salad. If you are looking for other side dish recipes, you might also like these recipes: Southern Sweet Onion Casserole, Creamy Make-Ahead Mashed Potatoes, and Easy Spicy Southern Corn Casserole. Need more ideas, click here to see all of my side dish recipes. Cut the head of cauliflower in half and then into quarters through the core. Then, run your knife between the florets and the stem and cut the stem out. Discard the stem and cut any large florets into smaller pieces. Add the cauliflower and 2 teaspoons salt to a large pot of boiling water and cook for 5 minutes. Drain and rinse with cold water to stop the cooking process. 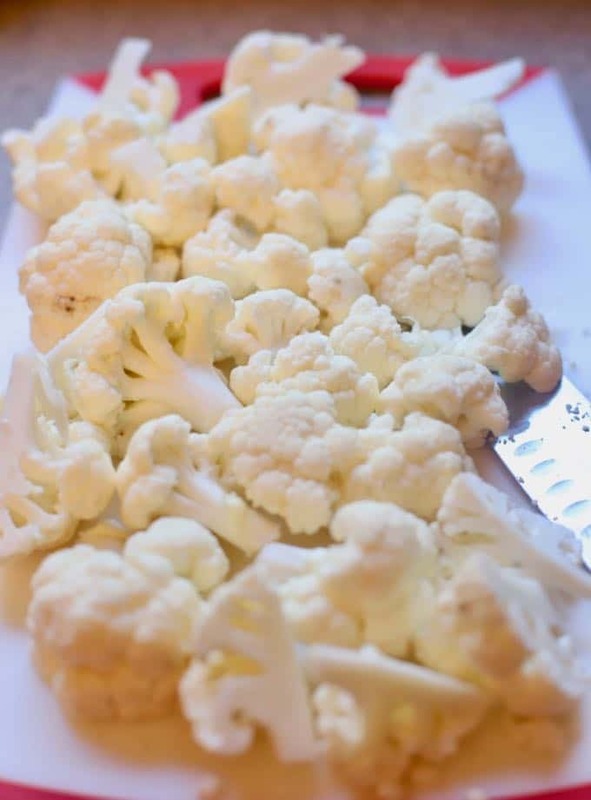 Add the cooked cauliflower to a 9×13 baking dish which has been sprayed with non-stick cooking spray. Sprinkle the bacon over the cauliflower. Set aside. 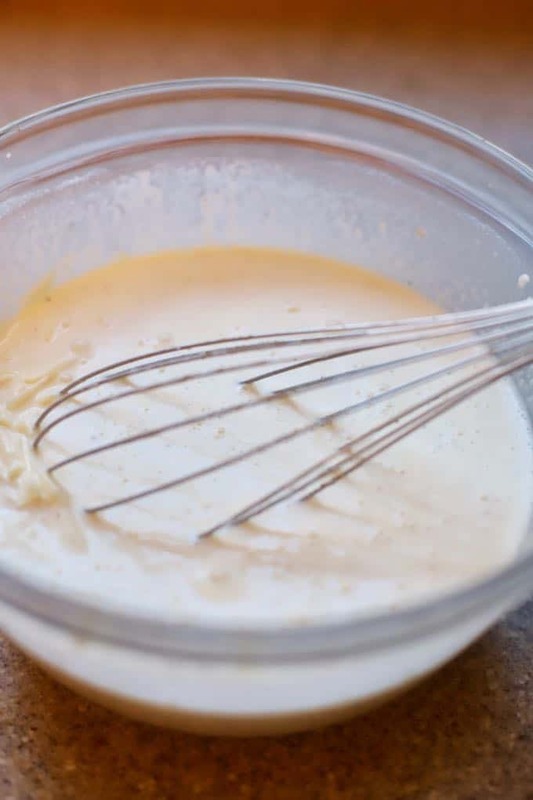 Add the eggs to a medium-size bowl and whisk well. Add the flour slowly, whisking constantly to prevent lumps. When the flour is incorporated add in the milk and cream. Whisk to combine. Add the salt, pepper, and nutmeg and whisk to combine. Add 1-1/2 cups of the gruyere cheese and mix well. 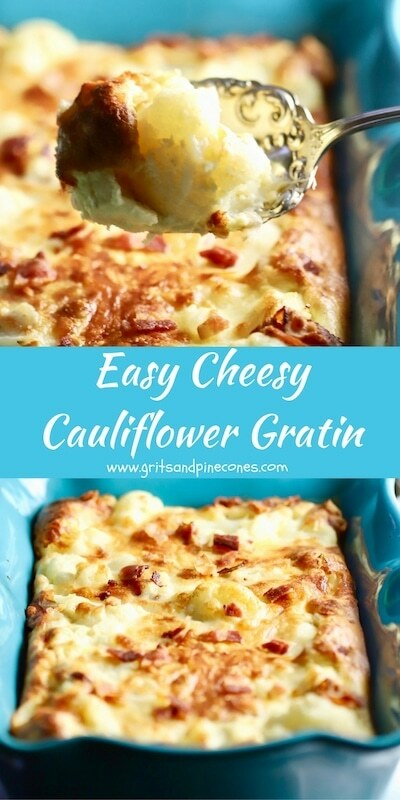 Pour the milk and egg mixture evenly over the cauliflower and sprinkle the remaining cheese over the top. Bake for 25-30 minutes until the gratin is puffed and golden and a knife inserted in the center comes out clean. Serve immediately. Easy Cheesy Cauliflower Gratin is the perfect rich, creamy side dish for Christmas dinner or anytime you want to treat your family or guests to a special dish! Add the cooked cauliflower to a 9x13 baking dish which has been sprayed with non-stick cooking spray. Sprinkle the bacon over the cauliflower. Set aside.